At least four people have been killed by a train derailment that flipped at least 5 cars on their sides and narrowly avoiding landing in the Hudson River. A Metro-North Railroad train derailed Sunday morning in the Bronx along the Hudson River, killing at least 4 people and injuring many more. 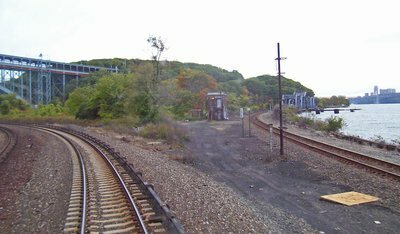 The train was headed to Grand Central Station from Poughkeepsie, New York, which departed the Poughkeepsie station at 5:54 a.m. The cars derailed at about 7:20 a.m. near the Spuyten Duyvil station under the Henry Hudson Bridge on the Hudson Line. Four or five cars on the seven-car train derailed about 100 yards north of the Spuyten Duyvil station. The first car of the derailed train came within yards of landing in the Hudson River. A New York Fire Department spokesman, Jim Long, told the New York Times that a total of 67 people were injured, 11 of those suffering critical injuries. Firefighters worked t remove passengers from the cars, which were lying on their sides. One passenger, Joel Zaritsky, was on his way to New York for a dental convention when the train derailed. 130 FDNY firefighters responded to the incident, which was reported by the train’s engineer. The MTA plans to recover the black box in the train to learn how fast it was traveling at the time of derailment. The large curve in the track where the derailment took place is a slow speed area. A freight train derailment occurred at the same location last summer, but there were no injuries. Image by Daniel Case via Wikimedia Commons. Subject: LongIsland.com - Your Name sent you Article details of "Metro-North Train Derails in the Bronx, Leaving 4 Dead and Dozens Injured"